Learn Craps Yo, the Fun & Easy way to learn craps. 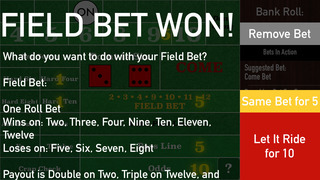 Built around Learning Craps, Learn Craps Yo contains easy to understand explanations for every bet. Built by a Former Vegas Craps Dealer turned Software Developer, Learn Crap Yo is built with expert-level attention to delivering an authentic Craps experience. - LEARN AS YOU PLAY!